After Chichele adopts an investigative and interdisciplinary approach. The period has been chosen precisely because the inner workings of English intellectual and religious life during these years have proved challengingly resistant to the formation of grand critical narratives. What are the chief currents driving the intellectual and cultural life of the church in England during this period? What happened to intellectual questioning during the period, and where did the church’s cultural life express itself most vividly? What significant parochial, regional, national and international influences were brought to bear on English literate practices? In order to address these questions, the conference will adopt an interdisciplinary focus, inviting contributions from historians, literary scholars, and scholars working on the theology, ecclesiastical history, music and art of the period. This entry was posted in Conference, Uncategorized and tagged 15th Century, 16th century, bishop, chichele, Church, culture, englands, english church, religion on March 23, 2017 by costanzabeltrami. Lecture series: Visibilité et présence de l’image dans l’espace ecclésial, INHA Paris, March 24 – June 16, 2016. The analysis of medieval Church space requires wide-ranging consideration of mounmental and ritual context. Current research focuses on the reception of images, and on the visibility and legibility of images. Both in the Latin West and in Byzantium, consideration is given to the mise en scène of the sacred through the interaction of monument, rite, objects, decoration and perception. This lecture series features experts of both the Byzantine Orient and the Latin West, focusing on questions raised during an introductory session on 25 Septembre 2015. A large space will be left for discussion with the aim of obtaining a multi-disciplinary perspective on the medieval image. This entry was posted in Lecture series, Uncategorized and tagged Architecture, byzantium, Christian West, Church, liturgy, religious image on March 16, 2016 by costanzabeltrami. Brasses for the deans of Battle; Robert Clere, engraved c.1430, and John Wythines, Vice-Chancellor of the University of Oxford, and Dean of Battle for 42 years, who died in 1615 are to be found north and south area of the sanctuary respectively. This meeting, on Saturday 28th March 2015, is free for members and non-members of the Society. St Mary’s Church is located in Upper Lake in the centre of Battle with ample parking in the vicinity. The postcode for satellite navigation is TN33 0AN. The nearest station is Battle (served from London: London Bridge). This entry was posted in Excursions and tagged Brasses, Church, England, Tomb Sculpture, Visit on March 17, 2015 by James Alexander Cameron. In recent years, the artistic commissions of ecclesiastic and lay patrons – both individual and collective – have been a fruitful area of scholarship. Research addressing issues of sacred space, devotional practice, and the materiality of extant objects has generated new insights into the artistic provisions made for patronal commemoration and salvation. Often, however, the interests of lay and ecclesiastical patrons have been considered separately, with a lesser focus on how the differences in their status mediated a shared pursuit of commemoration in death. Clerical patronage of art in Renaissance Europe allowed for an expression of political identity and dynastic power during life, but how did their status and role in society affect their choices for the afterlife? Were ecclesiastical patrons more acutely aware of a pressing need to make provision for their personal salvation than their lay counterparts? If so, was this reflected when commissioning commemorative or devotional art? Was the desire to secure a wider intercessory audience expressed more consciously or emphatically in the art of the clergy? This conference seeks to shed light on the ways in which ecclesiastical patrons utilised devotional and commemorative art. Was there a dialogue between their individual selves and the institutions in which they chose to locate their foundations? Crucially, how do these foundations comment on ecclesiastical life and afterlife? By examining a category of patrons that was highly aware of devotional and commemorative practice, this conference seeks to gain a better understanding of art commissioned for churches by those appointed to participate in and lead them. A re-assessment of the recent historiography and scholarship concerning patronage in an ecclesiastical environment, especially when this contrasts with contemporary lay patronage. The relationship between patron and artist or patron and religious institution. Depiction of ecclesiastical donor and votive figures. 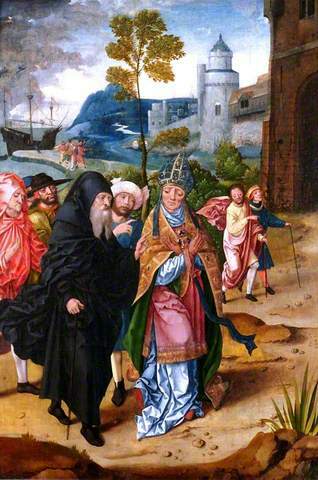 The implications of patronal choices of saints and iconography for the intended audience. The role of inscriptions, signatures and heraldry in commemoration. Reference to political stance and success in religious art. Conceptions of heaven and the afterlife as expressed in art. Ecclesiastical institutions prescribing limits to patrons and patronage. Positioning of chapels and memorials in churches. Rituals and liturgy of commemoration. The impact of the Reformation and Counter Reformation on ecclesiastical patronage. The Renaissance Symposium offers the opportunity for research students at all levels from universities in the UK and abroad to present their research. Unfortunately, we cannot offer travel subsidies. Applicants from outside London are, therefore, encouraged to apply to other funding bodies for travel bursaries to attend the conference. Abstracts for 15-20 minute papers, not exceeding 250 words, should be sent with a brief academic CV (100 words) to Lydia Hansell (lydia.hansell@courtauld.ac.uk) and Joost Joustra (joost.joustra@courtauld.ac.uk) no later than 2nd February 2015. Successful applicants will be notified by the 12th February 2015. This entry was posted in Call for Papers, Conference and tagged Agency, Church, Ecclesiastical, patronage, Prelates, Symposium on November 29, 2014 by James Alexander Cameron. © André Joose via Twitter. 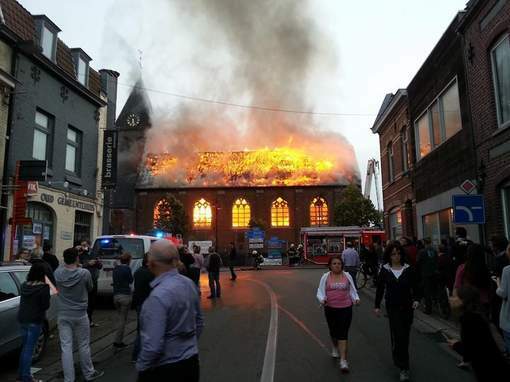 A fire in the church of Sint-Jan de Doper in Anzegem, Belgian has caused serious damage to the building, some of which is around 800 years old. The cause of the blaze, which broke out on the 16th October was apparently a faulty heating system. The fire started in the nave (this video captures the collapse of its roof) but unfortunately fire crews could not stop it spreading to the east end of the church (collapse of the spire). Although many reports have been that the church has been “completely destroyed”, it is clear that this is not the case. The town council are looking for options for its restoration as a centre with more diverse community functions. Indeed, you can see from the videos that the blaze has completely burnt off the roofs of the building, but the outer aisle walls and arcades are still standing. The biggest concern will be consoldating the most significant part of the building, the twelfth-century Romanesque crossing tower. This entry was posted in Current Events and tagged Belgium, Church, Destroyed, Destruction, Fire, News, Romanesque on October 20, 2014 by James Alexander Cameron.